The real estate industry is continually evolving. In recent times, the need for making more profitable property decisions, reducing inefficiencies, and providing better customer experiences has led the industry to turn to technology. It’s no wonder that real estate technology investments have been on a rise since 2013. Global venture capital investment in real estate technology exceeded USD 12 billion in 2017, with deals worth over USD 5 billion made in the US alone. Rapid innovation, fueled by startups, is changing the face of the real estate industry. Here’s a closer look at the emerging technology trends and the areas that they will impact the most. Time is valuable in real-estate selling and customers that are not a good fit or have no intention of buying can be a complete waste of time and money. To earn more from their time, real estate companies are employing AI-based chatbots that discern customers’ preferences to provide pre-qualified leads to agents. Moreover, chatbots are enabling better communication with potential customers by promptly addressing concerns that buyers have during the sales process. Data generated by chatbots is also used for insight generation and better customer service with the help of AI and machine learning. By analyzing data from the smart objects within a property, along with inputs from chatbots, property managers have access to clear, detailed, and structured data that can be integrated into a workflow and managed for greater usability. Finally, the function of chatbots and AI within BIM has application in the design and construction of new architecture. A chatbot that can scour all the data gathered by smart objects can make recommendations based on that information. Property management is crucial but can be extremely demanding, especially for landlords and agents that deal with multiple properties. Intelligent homes powered by AI and machine learning algorithms help in easing off the pressure by automating tasks such as setting the rent, screening tenants, alerting the necessary contacts when there’s an emergency, among others. In addition to helping property managers inspect premises remotely, new-age brokerage firms are applying deep learning capabilities to find quality properties, provide more accurate real estate valuations, find underutilized properties, and help property buyers to estimate the future value of their assets. With the ability to streamline and establish transparent and secure transactions, blockchain technologies are increasingly gaining ground in the real estate industry. Startups such as Meridio and i-House implement blockchain to allow users to share ownership of property, making real estate investment accessible to more people. Blockchain technologies are also providing a secure means to manage, validate, and store property documents to prevent fraud. One of the most significant impacts of blockchain on real estate, however, is the transparency it offers in making transactions across any part of the globe. ShelterZoom, for example, implements an Ethereum-based platform to allow property buyers, sellers, and renters across the globe to transact in real-time with minimal paperwork. As a result, users can keep a check on extortionate intermediary charges and eliminate middlemen. Regulatory compliance and operational due diligence are a tedious but critical part of the real estate industry. Reviewing documentation for properties and portfolios, validating insurance, and checking compliance obligations, which help in identifying and quantifying areas of risk, are some of the important tasks that due diligence entails. AI is now being used extensively to standardize and automate the process of meticulous analysis and discrepancy identification. For example, Drooms NXG provides real estate managers with a place to store and structure deal-relevant information and automates the red flag analysis as well as real-time document translation. This enables professionals to bypass most of the manual tasks related to due diligence. The Findings Manager allows for the assessment of risks and opportunities inherent to a transaction, whereas the document translation feature offers a competitive edge in cross-border deals. Similarly, JLL has signed a global cooperation agreement with Leverton, a machine and Deep Learning technology startup, for automating and digitalizing key administrative processes in lease management. The technology that Leverton offers enables the identification, extraction, and management of key terms and data from corporate documents, which include leases and contracts. JLL plans to integrate these systems into its own global technology platforms to transform the way lease documents are reviewed, analyzed, and managed for its clients. Goldman Sachs Research estimates that the market for virtual reality in real estate alone could generate as much as $2.6 billion by 2025. The use of virtual and augmented reality technology is now giving buyers and sellers a new way to visualize constructions. For example, the homes listed with Redfin come with a 3D walkthrough. Matterport is supplying a dimensionally-accurate model of the space exactly the same way as human eyes would see it. The company also has plans to introduce VR walkthroughs over the next few months. roOomy, a virtual staging technology company, allows buyers to visualize any room or space the way they would decorate it themselves. Drawing from a catalog of more than 100,000 furniture and household items, roOomy allows users to upload pictures of a room and virtually decorate it to reflect personal tastes. 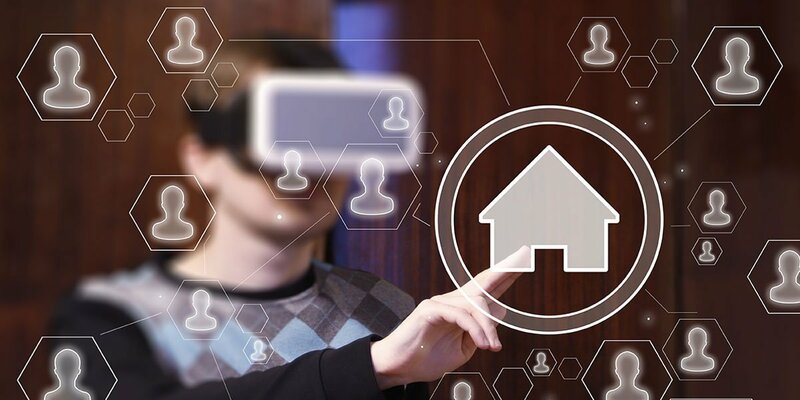 Using 3D modeling, Virtual Xperience allows VR headset users to access the full walkthrough experience in a property that is in development or is under construction. Developers are using real-time options, which customize color palettes, materials, furnishing, and lighting conditions, to help buyers personalize and visualize the unbuilt spaces as well as analytics to understand market trends. Major technology vendors are also investing in a confluence of technologies that can have a major impact on the real estate industry value chain. Cisco is focusing on its concept of ‘digital ceiling’ that consolidates smart lighting networks and other internet-connected devices into a centralized dashboard that can be controlled via a smartphone application. The system includes smart lighting that doesn’t require a separate electricity source as it is powered by the Ethernet network. Hitachi is highlighting its IoT strategy based on a technology called Lumada. The company claims that this platform will be relevant across a broad range of applications including smart buildings and connected vehicles. Honeywell’s IoT strategy has already been implemented in smart buildings worldwide. It has developed a mobile app that enables building occupants to report issues with heating or cooling. The real estate industry has always evolved according to the needs of the market. As the influence of technology continues to grow, players in the real estate value chain will need to adapt to remain competitive. Industry experts believe that IoT will be a game changer in the real estate industry. For developers, this means that integrating smart home and smart logistics capabilities into their real estate development projects will be crucial to optimizing resources and adding value to their offerings. Technology platforms will enable smaller residential assets to transact on platforms and make exchanges in reasonable quantity, leading to an exponential growth along with radical changes. Appropriate risk management strategies will have to be adopted by real estate developers and players in order to remain in sync with the changes happening across the real estate spectrum. Netscribes provides strategic insights and reliable information on trends across varied markets and technologies. To know more or to request a consultation, contact [email protected].